Today, we’re highlighting Madison James wedding dresses from the Fall 2018 collection. We’ll be the first to admit, we had a hard time editing the post down to a few gowns! You’ll quickly see why it was so hard to choose just a few! The Madison James Wedding Dresses for Fall 2018 are a delightful bridal collection filled with new classics. Some of our favorite Fall 2018 looks feature romantic tulle, beautiful delicate straps, deep open backs, embellished bodices, side details, and striking deep V neck gowns. We also love all the new takes on sleeves! 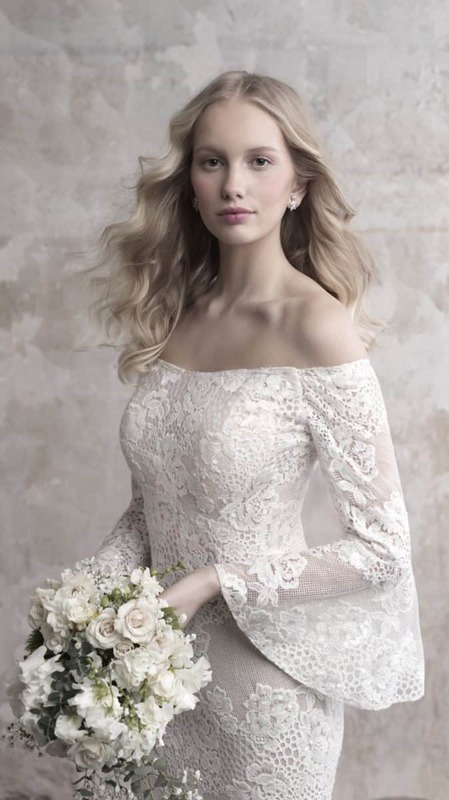 If you agree, you’ll love the off the shoulder long-sleeved gowns, cold shoulder draping, and cap sleeve looks. 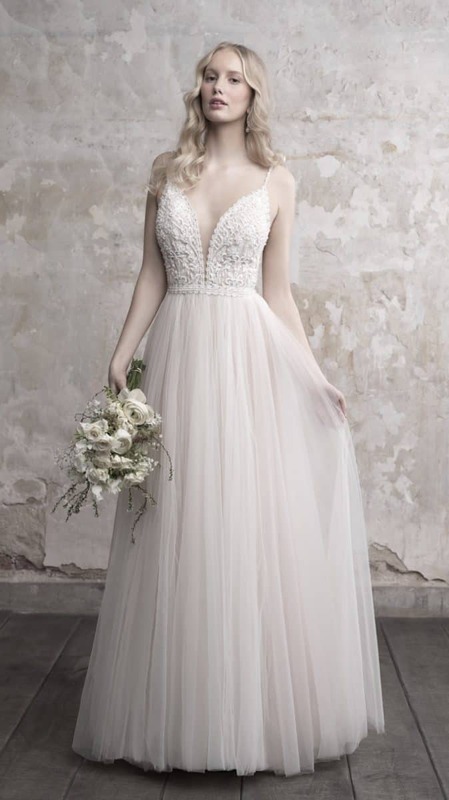 After you’ve seen this preview, please visit Madison-James.com to see all the views of each dress, to learn more about each gown, and to locate the bridal retailer nearest you, where you can try on these beautiful wedding dresses! 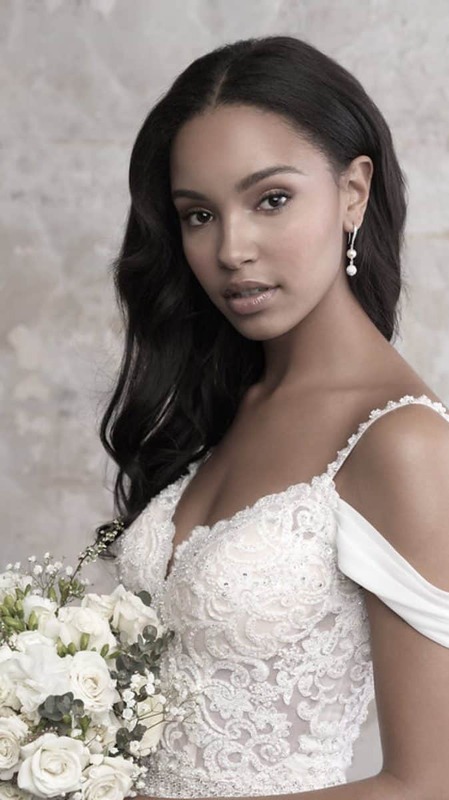 The Madison James Bridal Collection was created for the modern, sophisticated bride, and is a favorite of Dress for the Wedding editors and readers! The youthful spirit of this line always features fresh silhouettes, unique fabrics, and innovative textures and patterns. 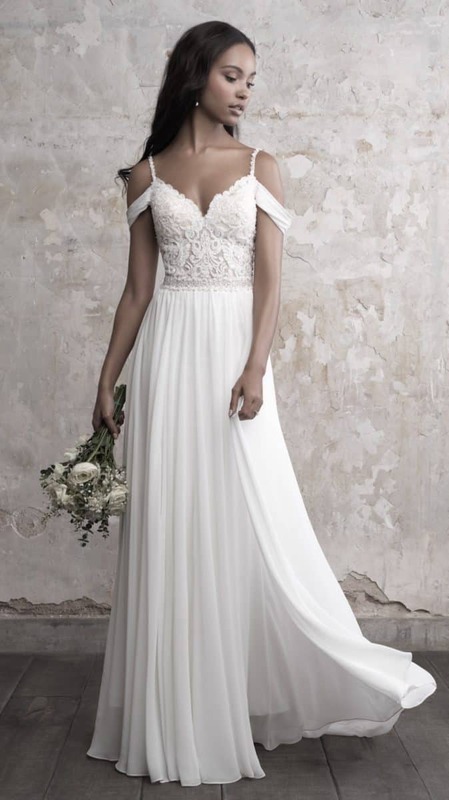 Madison James wedding dresses are romantic and chic with both a nod to classic styles, but with contemporary and free-spirited looks. Beading, textural fabrics, and gorgeous embellishments accentuate the unique, clean silhouettes. Now here are the dresses! A delicate crocheted lace sleeveless sheath wedding dress with a deep V neck. Lace wedding dress with a beautiful tulle overlay. 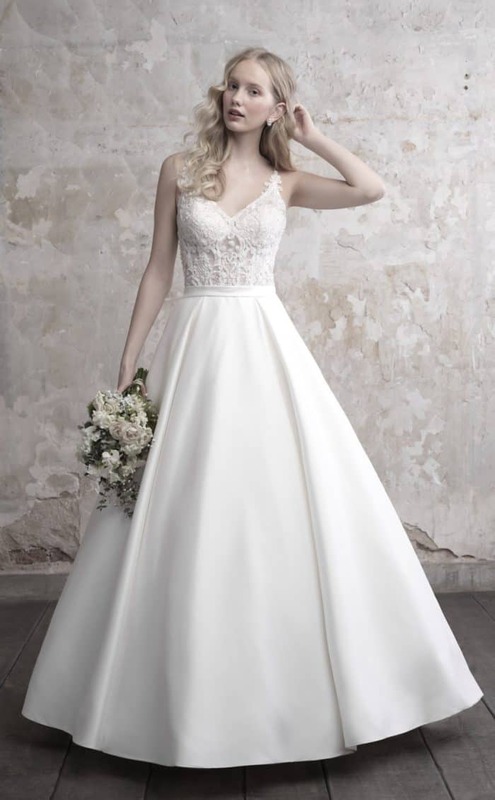 Style MJ451 has a deep neckline and delicate straps. with beading that edges the neckline and waist. 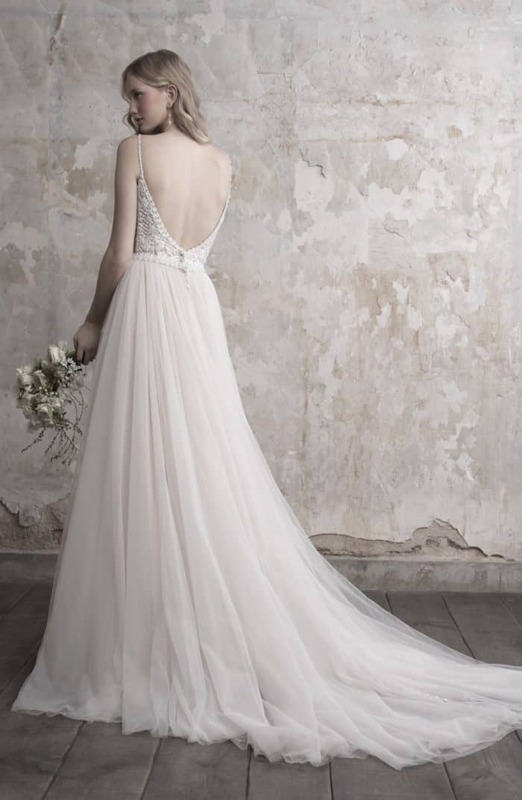 Features a open back with sheer sides and beaded detail. 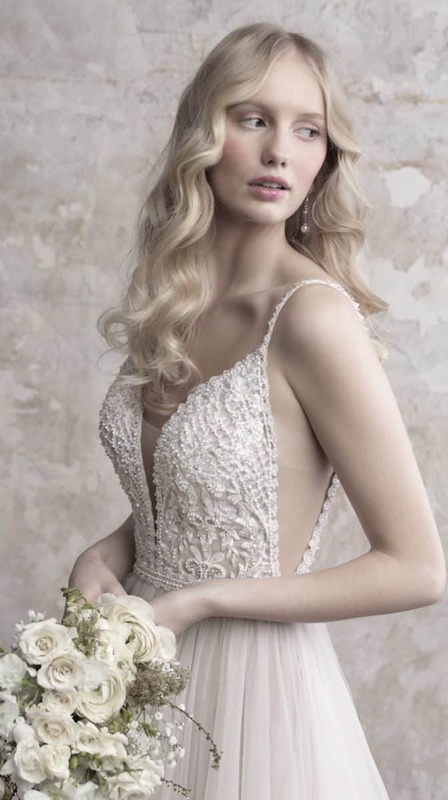 A beautiful cold shoulder wedding dress with beaded and embroidered detailing. 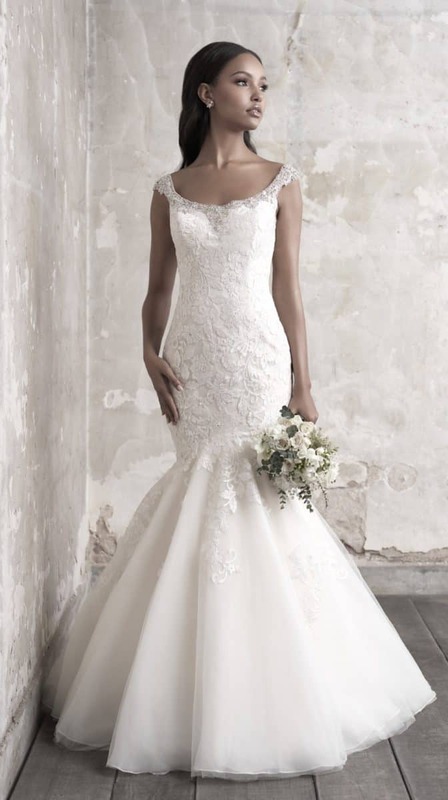 A stunning cap sleeve lace wedding dress with bateau neckline. 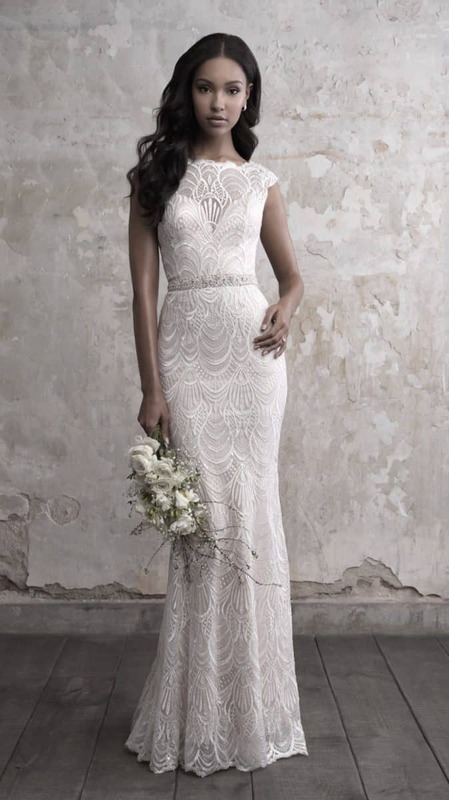 A feather like lace creates a tiered effect in this sleek sheath bridal gown. 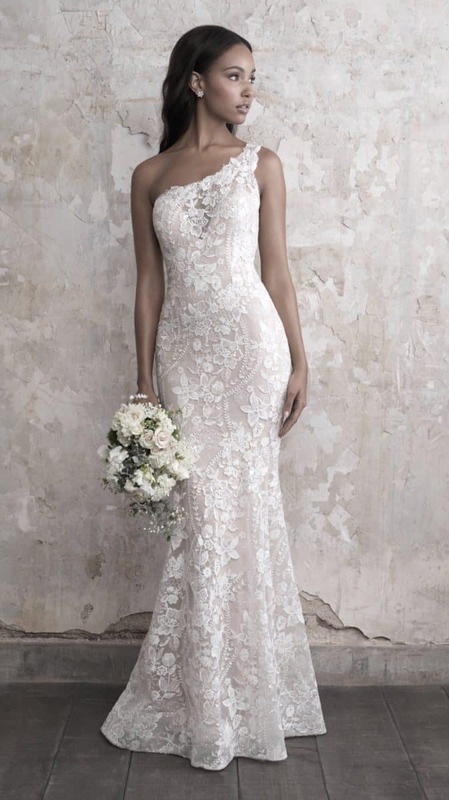 This opulent sheath wedding dress with a rich lace-like textured and beaded details. Open plunge back with buttons and a stunning train. A one shoulder lace wedding gown with floral appliques. Floral embroidered appliques and button up the back beautifully accent the sheer illusion back of this stunning gown. 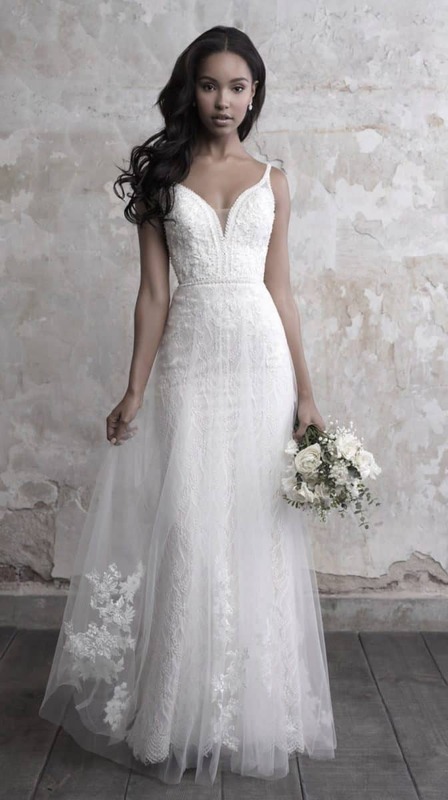 Perfect for a beach wedding, rustic wedding or a destination wedding, this crocheted lace wedding dress with v neck and long train features a charming straps that tie in a simple bow at the back. 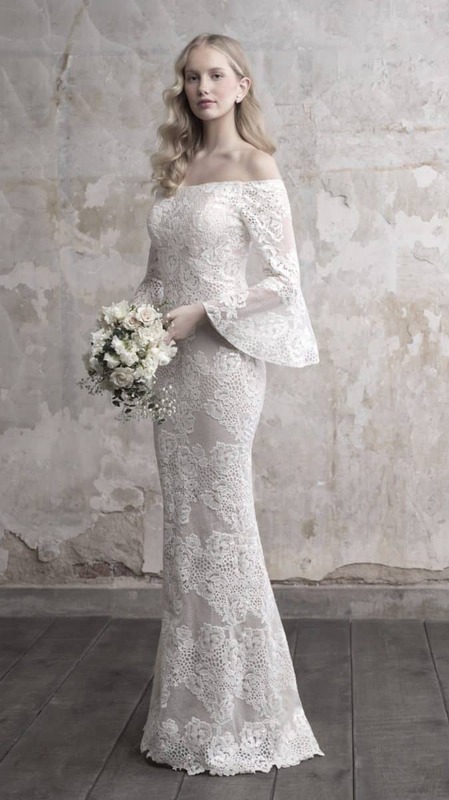 A vintage style lace wedding dress with unique off the shoulder style and bell sleeves. Lace and tulle wedding dress with deep V neck and classic A line skirt. Mermaid wedding dress with tulle layers, and portrait shoulder styling. 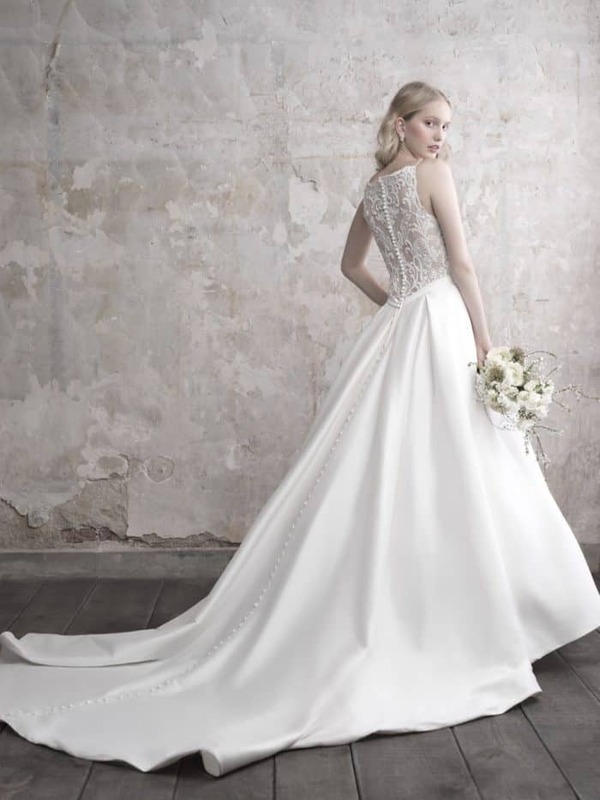 This bridal gown also features an illusion back in addition to beadwork and straps. A modern lace wedding dress with embellishment and beading and beautiful sheer side mesh details. 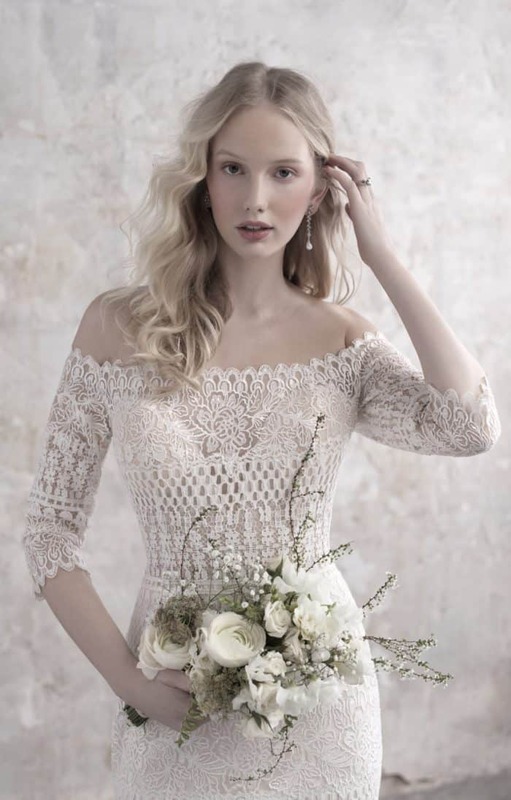 Featuring stunning crocheted lace, this off-the-shoulder neckline is shows off the lace edging beautifully. this stunning style also features long sleeves and sheer lace back. Madison James Collections are known for their attainable pricing and their ability to accent the natural beauty and delight of women in love! 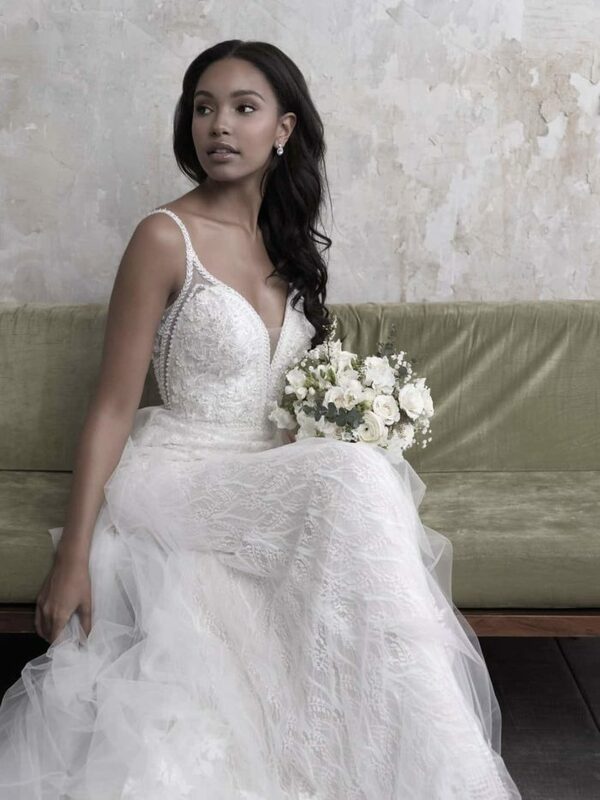 Even though we showed nearly all of the Madison James Wedding Dresses for Fall 2018 Please visit Madison-James.com to learn more about each gown, and to locate the bridal retailer nearest you, where you can try on these beautiful wedding dresses! 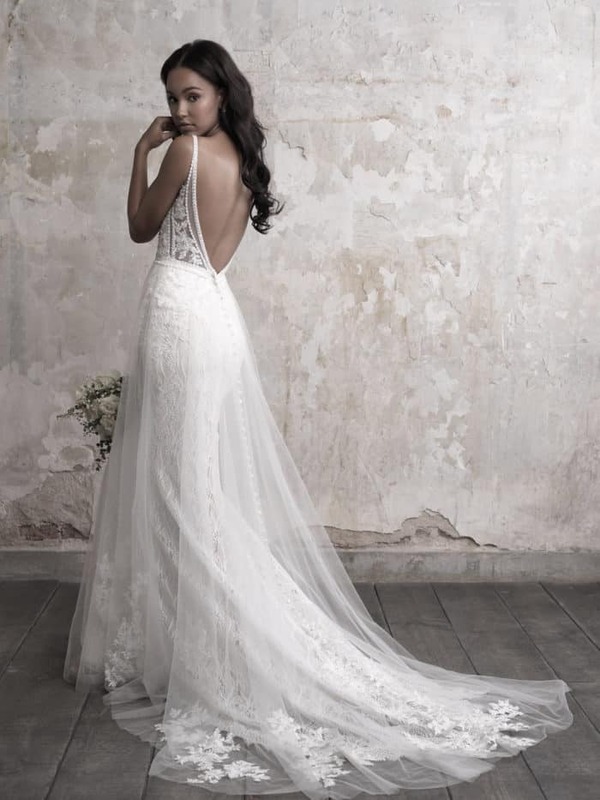 For more wedding inspiration check out the other wedding dresses we’ve recently featured. If you’re in the planning stages, you’ll also love our bridesmaid dress inspiration for finding the perfect look for your wedding party. Please also take a look at our picks for wedding accessories including wedding shoes and bridal earrings!